Sand Artist Sudarshan Pattnaik created a huge sculpture in Odisha today as a tribute to Dev Anand who passed away in London last night. 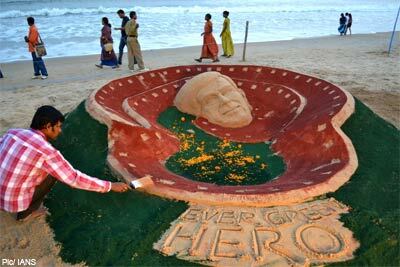 Pattnaik said he used 5 tonnes of sand and 5 hours to create the face of the star with a 25 feet long movie reel bearing the text 'Evergreen Hero'. Hundreds of people gathered at the Chandrabhaga beach at Konark in Puri district and paid floral tribute to the actor's sculpture. 0 Response to "Sand Artist's tribute to Bollywood Legend Dev Anand"